his dress comes below the knee, the model on the picture is 1.74m. TIP If you are in-between sizes and you have a fuller cup please choose the bigger size for the most comfortabel fit. Take measurements while wearing the undergarments that will be worn with this dress or gown (and nothing else).Consult the Sizeguide to determine which size you should purchase. BUST: Measure around the fullest part of the bust, keeping your elbows tucked down toward your sides.WAIST: measure across smallest point. Bend to one side to find the natural crease of your waist. HIP: Stand with your feet together, measure around fullest part of your hips and rear Still in doubt? Please do not hesitate to contact us! 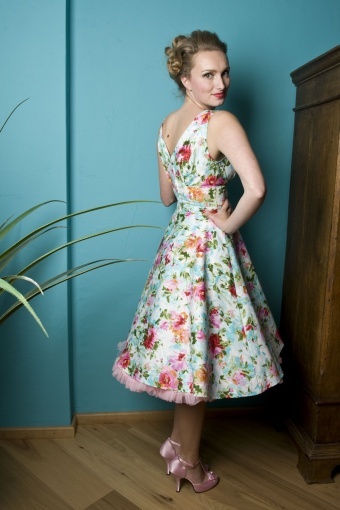 The 50s Sweet Dreams Flora swing dress from Stop Staring! 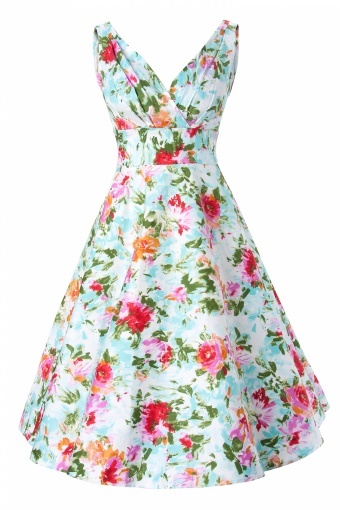 This fantastic 50's inspired swing dress is an absolute dreamdress! Made of a stretchy coton in a vibrant floral pattern. Dress zips up the back. The top has a beautiful thick shoulder strap and slightly crosses over the bust, making it a perfect discreet V-neckline (also on the back). The vintage gathers in the bust look so 1950s, pull out your pointed heels girls! Fittted midriff and full circle skirt which can be worn with a petticoat as shown on the picture. Kim wears our Pinup Couture Pink Satin shoes. Stop Staring! is one of the most exclusive retro labels available, be pleasantly surprised by the high quality and great fit! Gisteren de jurk bestelt en vandaag al in huis! Helemaal super gewoon. De jurk past perfect en met de petticoat eronder is hij extra feestelijk. Ben er helemaal blij mee en zal er super uitzien met de bruiloft van mijn zusje.